We understand that your wedding day is a very special occasion. We cater to every brides need by offering a wide variety of packages for you and your bridal party. Prices given upon consultation and 50% is required for a deposit. We ask that you call us at least 24 hours in advance if you need to cancel your appointment. If you fail to cancel your appointment within 24 hours you will be charged 100% of the service cost. 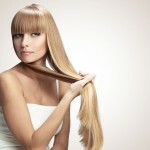 Last minute cancellations and late arrivals impose a great inconvenience and loss to the salon. As a courtesy, we try to call and confirm your appointments a business day prior to your appointment. However, if we are unable to call or reach you, please understand that it is your responsibility to remember your appointment dates and times. As a courtesy to other salon guests, and in our efforts to offer a relaxed and professional atmosphere, we ask that you do not bring children if they are not recieving a service. Any returned check will result in a $25.00 service charge plus the face amount of the check to be paid before any other services can be rendered. We welcome walk-in customers. However, if it is not convenient with our schedule, you may have a waiting period or need to schedule an appointment.